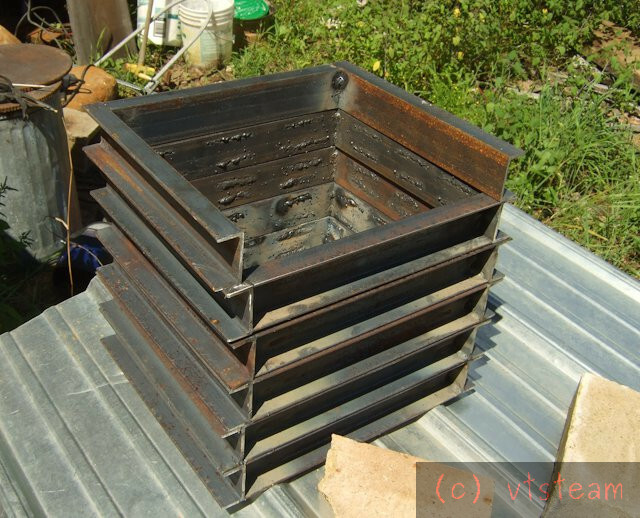 After deciding not to cast aluminum flasks, and resigning myself to wood for iron casting until I could acquire a lot more aluminum, I started to think of ways of protecting the wood -- of particularly the cope, which gets the most abuse. 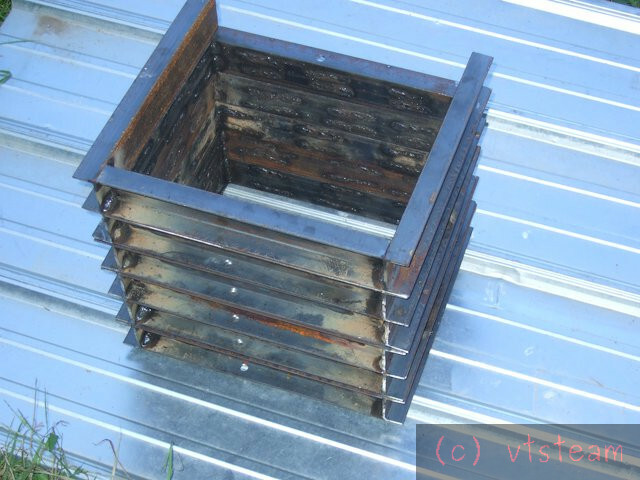 I was thinking that if I made a box of 1" angle iron, I could press it down into a wooden cope to protect the edges and give a drip edge to keep spilled iron off the side. Then I thought if I actually just replaced the wooden cope with two 1" angle irons welded together, that would be better. Then I though well you might as well just buy channel. But could get expensive. Might as well find out, though. Any excuse to go down and visit with Lester in his old machine shop, really. The real thing, overhead belts, dusty shapers, etc. And of course a nice long chat before getting down to business. I won't go into the hour long swapping of tales between myself, Lester and various customers, plus showing him my last iron casting, which he greatly appreciated. Anyway I asked how much for a stick (20 feet) of angle vs a stick of channel iron. Lester took out a pencil and worked it out on his lunch bag. I'd told him what it was for, and we both figured a stick of channel would make five 12" x 10" ID flask halves. Seemed like six would make more sense, so he added on another 4 feet. Fifty three dollars, he said. It came out the same if I fabricated the channel up from angle, than if I bought it ready made -- within a couple dollars. I was thinking it over, and said will you cut them channels in half for me Lester to fit in the truck? No, he said, how bout I cut them up into your 24 pieces? How much would that be, I said. Same fifty three dollars, he said. Thank you Lester I said, I'd like it then. But it was another 20 minutes talking about his time in the Coast Guard before we actually got to cutting the channel up on his Kalamazoo. While I was watching it slice through the channel like it was made of cheese, I thought of my 4 by 6 Harbor Freight bandsaw nibbling away at 24 pieces of channel. 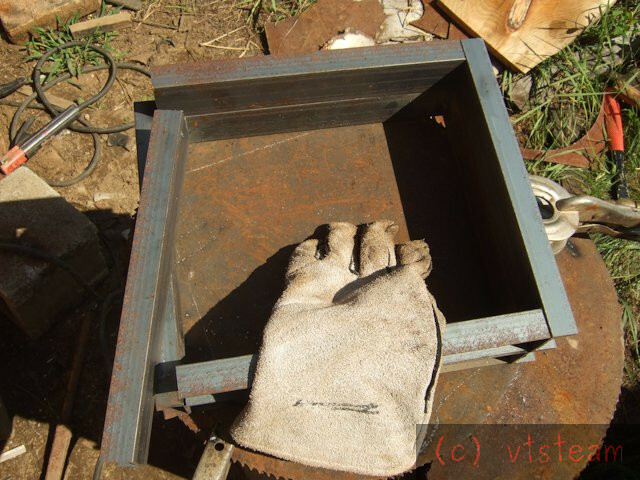 Just then I happened to notice behind the saw and under a big pile of assorted stuff, like a belt sander, a slip roll, and lots of metal shapes was a familiar arch and a heavy 1 foot thick cast iron bed about 10 feet long -- never noticed it before. Is that a shaper, I asked? Yup that's a shaper, he said. Must have been something to see that work, I said. I remember my old man cutting a keyway on a gear with it, he said. That would have been a big gear, I said. It was, oh, like this he said stretching out his arms. I got my 24 pieces, and headed home in the rain. Not much chance to weld it until this stuff lets up. But talking with Lester was almost as much fun as making something. You know that you should have had a tape recorder going so that we could all enjoy the stories. Lester sounds like my kind of guy. Don, his story involved approaching a disabled Russian submarine off of Greenland. Mine involved being aboard a sinking schooner off of Atlantic City. Not much of interest, really. Laid out the first one, tacked it together, checked it for square, then started building the others clamped on top of that one as a pattern. 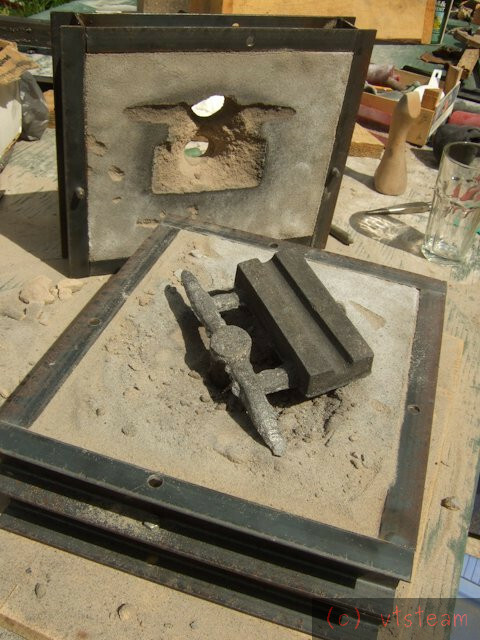 I wanted to roughen up the inside surfaces to keep sand from breaking out of the flasks -- they were waaay too smooth so I just used up some old welding rod stubs I'd been saving on the insides. That rascal Lester only gave me 23 pieces of channel instead of 24! Hence the top C shaped flask. Oh well, we both should have counted. Guess we're getting old. I'll go down town for more Lester stories Monday. 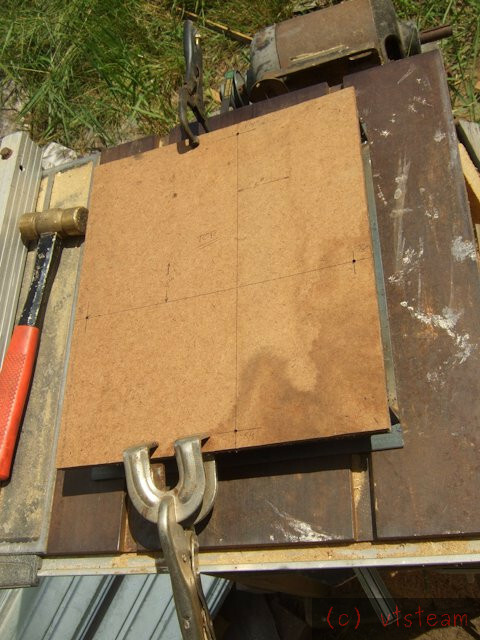 I made a pattern out of Masonite to drill pilot holes. After opening the holes to 3/8" I turned six 3/8" inch tapered pins on the lathe and welded them in place in the copes. Almost done -- just need that last piece of channel. Looking good Steve. Are the extra holes so that you can bolt some together to increase the capacity for larger patterns? Mayhem, yes. I also thought I might be able to use the extra holes for clamping the top and bottom plates, for keying match plates -- or even some other use I don't know of now, down the road. Point of interest -- the flanges are 1" wide. I thought I could also use these metal flasks with drag flasks made of wood if I put the centers of the holes at 5/8" in from the edge. With a 3/8" pin, that would center the pin on 3/4" thick wood assuming the drag had the same inner dimensions as the cope. The cope takes most of the heat from spills, and since its flanges are 1" wide, while wood is 3/4" wide, drips would tend not to run down the drag, as well. So wood drags could extend my number of usable flasks in a pinch without additional cost, and probably would last well. For day to day use, I will just use the metal flasks together. I welded some 1" angle iron in my flasks - in the horizontal orientation along the long sides, with the apex of the angle facing into the flask and the two legs of the angle flat against the side, so that the sand was trapped by the shape. Worked well and simple to do. re. angle inserts -- I didn't want to add inserts unless absolutely necessary because they reduce the capacity of the box. A 1" wide insert on each side would convert a 10" wide box to an 8" box. But an 8" box generally does not require inserts at all, so one might as well just make an 8" wide box with no inserts. The limit seems to me somewhere around 8-10 inches depending on the sand and the roughness or shape of a box, and its depth. Length also affects it. My wooden 10" x 10" x 3.5" flasks never slipped -- they were roughened up on the inside with a handsaw before varnishing. These were deep, and relatively small. Now I've gone to 12" x 10"x 2" and smooth metal -- and to me, with my sand, I'm pushing the limits. That's why I roughened up the inside with rough welds. Ironman's boxes have draft -- and are 12" x 9" x 2". The draft helps as long as it is oriented the right way, though the drag is usually turned over, so at least one point the draft doesn't help. Commercial boxes like yours and Rob's have a pressed in bulge -- but that goes outward so it doesn't cut down on the inner dimension of the flask relative to the flask size and quantity of material used. 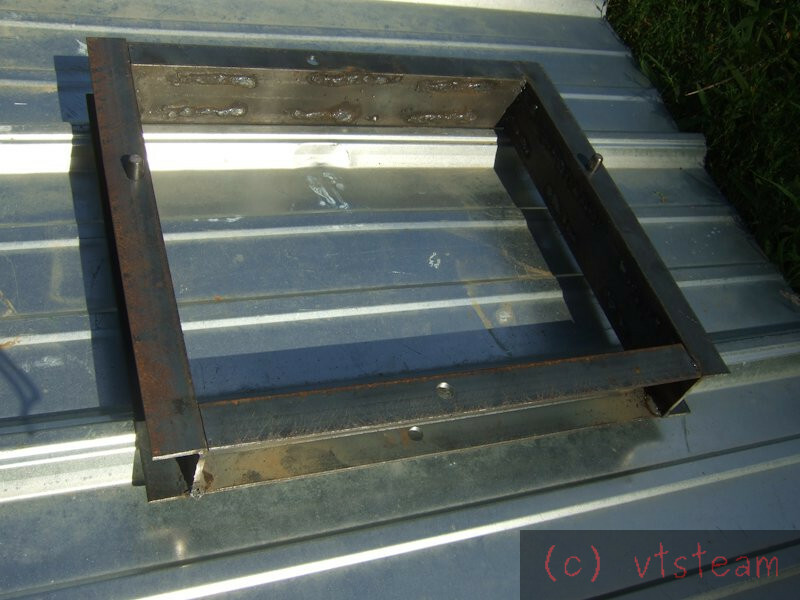 If I do have to add something more than the welds, I will try to minimize the width reduction. I could spot weld 1/8" steel wire along the sides for instance. But I think I'm okay -- I did a test ram-up today and had to abuse it fairly hard to get the sand to shift, although I was able to shift it. There are two things at work in slippage, as I see it -- one is true slip along the edges, the other is deformation -- sag -- in the middle. Inserts can't control the latter it's mainly a function of width, depth and green strength. Wider shallower flasks will tend to foster that kind of collapse. Mine mainly seemed to true slip when pushed to it, so if needed, inserts would counteract that. Sorry to talk about these small details so much -- just stuff I was thinking about while building and trying these. If you haven't finished welding them, how about flipping the channel on the long sides through 180 degrees so that the C faces inward ? Some large commercial copes and drags have a grid cast into them to resist sag. I have some 'railing flasks' designed for casting iron fencing that have braces across the width for this reason. Mind you when on those rare occasions that I've used them for long thin items I've had to use a block and tackle to both invert while ramming and place for pouring. You could. This kind of thing really just boils down to personal preference. When I thought about it before making them, 1" seemed a lot more than needed, you'd need to make 48 miters or 24 cutouts at the ends of the pieces, make and attach handles, add long pins, and wouldn't be able to bolt them together as simply, so for personal preference I chose this way. It's extremely simple to build -- all pieces are 12", and cut square. I like things simple. They are really great to work with, I have to say -- it's wonderful having a handle that extends all the way around the flask, very short pins that slip right into place. They just really pull and go together nicely. Hard to describe. Size and balance feel right. The cope also stands up on edge very positively even with sand on the table. Just a bunch of small things i noticed, compared to my wooden flasks. They feel good to work with. EDIT: Just noticed you said flip only the long sides -- so no cutouts or miters -- that would work. Personal preference again. 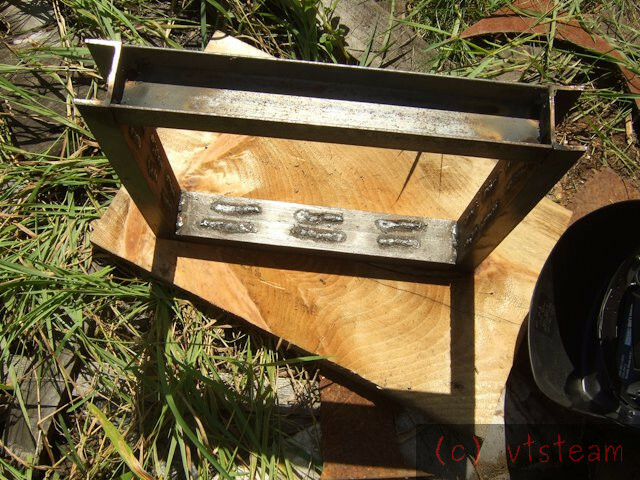 Andrew, I was thinking a heavy wire grid would work similarly on a fabricated flask if needed. I think I'm okay as-is with reasonable care in molding, but will alter if needed. I know what you mean about the cross pieces on larger flasks -- I have a flask with cross braces -- a custom wooden one required to cast the bed for the Gingery lathe. Sometimes commercial flasks have bolt in cross bracing which can be shaped to fit the pattern without interfering. Well, they work very well. Very happy with them! Bolted the bottom two together to form a deeper drag for this piece. Really good to see you back and reminding me of things I should be following up!